... and Wheeler and 19% of the electorate. According to ConservativeHome they are, anyway. The first prominent Tory to tell people not to vote Tory was Stuart Wheeler who not only told people to vote UKIP instead but donated £100k to the election effort at the same time. Then Lord Tebbit told people not to vote for the LibLabCon in what is widely accepted to be a thinly veiled message to vote UKIP. Next up is blogging legend, Guido Fawkes, who has encouraged right wingers (ie. Tories) to vote UKIP. Strangely, he also suggested wasting votes on the eurofederalist Greens and Libertas if you're left wing or centrist which is a shame because UKIP is a centre-right party but a positive message still from Guido. Peter Hitchens, the Daily Mail's attack dog, has also told people not to vote Tory. And finally there's the electorate, which Conservative Home seems to hold in as much contempt as the party it supports. Currently the polls have UKIP on 19%, the same level of support as Liebour and the Lib Dims. One fifth of the electorate are wrong? I don't think so. 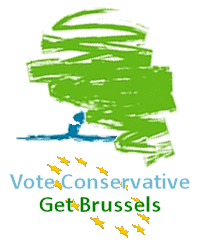 Voters have a simple choice when they go to the polls on June the 4th - they can vote for the LibLabCon or the Greens or Libertas and they'll be voting for ever-closer political union, to continue wasting £106k per second on the EU, for 75% of our laws being made by the EU and to hand over what's left of our tattered sovereignty to the European Empire. Or they can vote for UKIP, a vote to withdraw from the political union with the EU, to retain a free trade agreement like the one that this country voted for in the 1975 referendum and to return control of our country back to our own parliament. The Tories say they want to reform the European Empire from the inside but we all know that it is unreformable. The only question that remains is do you want more or less of the EU? If you want to lose your country to the European Empire then vote for the Tories, if you want your children to grow up British/English/Scottish/Welsh/Northern Irish (or Gibraltarian of course) then you have to vote for UKIP. Nobidy else is committed to ending our damaging relationship with the European Empire. It's simple really. This country voted for the EEC, a trading partnership and body. It got the EC, the Single Market and Maastricht. No one voted for that. And unless British people, not the corrupt anti democratic louts in Westminster, vote for the EU in a referendum, then we should vote for the only party that wants us to get out of the EU madness, ie, UKIP.